Since the UPS strike in 1997, organized labor and some policy makers have been highly critical of part-time employment. At the root of these criticisms is the alleged wage gap experienced by part-time employees. At first glance it appears that part-timers earn substantially less than their full-time counterparts. Dr. Barry Hirsch shows in this study that the apparent wage gap is not nearly as large some have claimed. In fact, once he accounts for all relevant factors, he finds the real wage gap to be either non-existent or quite small. The bulk of the wage differential between part-time and full-time employees is attributed to lower skill levels among part-time workers, and to the work preferences of those who choose part-time employment. Dr. Hirsch reaches much further than past examinations of part-time work by incorporating worker-specific skill measures, plus measured job skill requirements and working conditions. The major contribution of this study is this: it effectively dispels the notion that part-time employment carries any sizable wage penalty for similarly skilled employees. Dr. Hirsch shows that the part-time wage gap is particularly narrow among women, who compose 68% of the part-time work force. Many researchers have measured (and some have attempted to explain) the part-time “wage gap.” Overall, women in part-time jobs typically earn 25.9% less than women in full-time jobs, while the comparable figure is 46.2% for men. These raw figures, however, are extremely misleading. The first part of the Hirsch analysis concentrates on the differences between part-time and full-time workers in general. These differences are dissected using a range of important variables, including occupation, gender, years of schooling, marital status, region, industry of employment, job tenure, and specific measurements of hours worked. The study also taps Labor Department data on occupational skills (verbal, mathematical, spatial, problem solving, etc.) and working conditions. Dr. Hirsch draws on Bureau of Labor Statistics data to show that part-time employment is systematically concentrated among jobs requiring a lower skill level compared to full-time work for both women and men. As Dr. Hirsch puts it, “Full-time workers tend to be employed in occupations requiring higher levels of verbal, mathematical, problem solving, technical, and system skills.” These higher skills ultimately translate into higher wages for full-time employees, creating the illusion of a wage gap that is, in fact, largely explained by skill levels. This research finds that measurable personal and location characteristics, in particular age or experience, can readily account for a large portion of the part-time wage differential. For women, 33% of the wage differential is explained by these characteristics, while the comparable figure for men is 48%. When personal, location, and job characteristics are all considered, Dr. Hirsch accounts for 64% of the wage differential for women and 68% for men. After taking into account measurable personal, location and occupational characteristics, the part-time wage gap is reduced to 10.3% for women and 18.1% for men. Thus, approximately two-thirds of the traditional estimate of the part-time wage gap is accounted for by these measurable characteristics. Dr. Hirsch identifies the factors explaining the remaining wage gap by accounting for characteristics that are not typically measured in economic databases. On average, the wage “penalty” for women moving between part-time and full-time work is 1.4%, a fraction of the traditional estimates of the part-time wage gap. Men, on the other hand, experience a modest 4.4% penalty for being employed in part-time work compared to full-time work. These numbers show that similarly skilled and experienced individuals are subject to very little wage change as they move between part-time and full-time employment. The only area in which Dr. Hirsch is able to find a nontrivial wage penalty is among workers who switch both industry and occupation in moving between part-time and full-time work. This effect is likely due to younger employees switching out of non-career part-time jobs and into career-oriented full-time jobs, or vice versa. Even so, “the wage disadvantage is considerably smaller than that suggested by standard wage level analysis,” according to this study. No part-time wage penalty is found among those switching to a job in the same occupation or industry. Dr. Hirsch strengthens his analysis by examining one situation in which part-time work could play a substantial role in an individual’s career — during periods of displacement (layoff, termination, etc.). Evidence from the Labor Department’s Displaced Workers Survey, in agreement with the longitudinal results described above, indicates that there is no part-time wage penalty for women and a very small penalty for men. 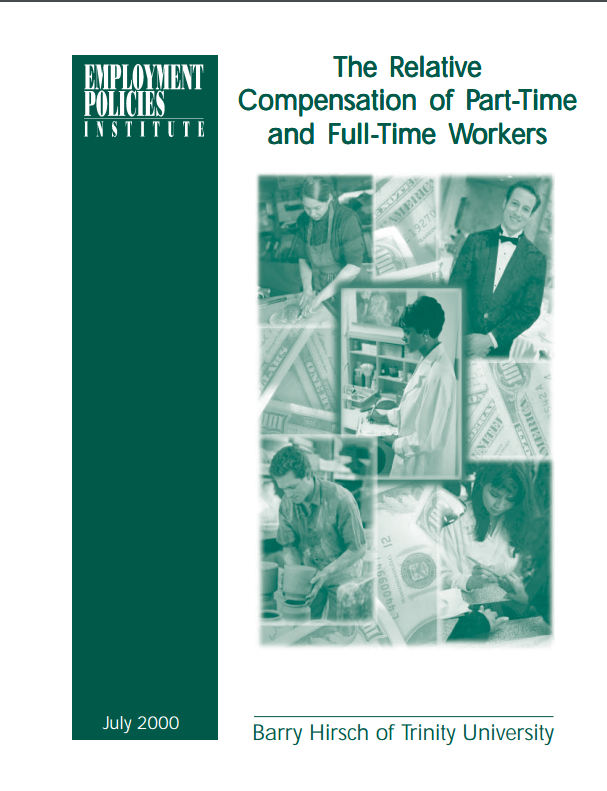 The study shows that some of the part-time wage penalty can be attributed to lower human capital formation among part-time employees. Employees build skills and experience by spending time on the job. Part-timers by definition spend less time on the job than full-timers. Over a period of years, this results in significantly lower skill levels among part-time workers relative to comparable full-timers. These lower skill levels translate into lower wage levels as well. Dr. Hirsch also points out that part-timers have less firm-specific experience because their tenure with their current employer tends to be lower. On average, women working part-time have been with their current employer 4.5 years, as compared to 7.5 years for women working full-time. Men in part-time jobs have spent an average of 3.2 years in their current job, compared to 8.8 years for those in full-time employment. It is not surprising that employers are generally less willing to offer higher wages to part-time employees who have been in their current job for a shorter amount of time, and have worked fewer hours while there, compared to full-time employees. It is important to note that part-time work is most often a voluntary arrangement. For family and personal reasons, an overwhelming majority of part-time employees prefers the flexibility of part-time employment. In 1997, only about two out of every ten part-time employees would have preferred full-time work to the part-time job they held. Dr. Hirsch’s findings on the wage gap (or lack thereof) apply to all part-time workers, whether voluntary or not. Based on the evidence, Dr. Hirsch concludes, “Virtually all of the part-time wage disadvantage can be accounted for by what are lower worker-specific skills among part-time than full-time workers…” To the extent that a part-time wage gap exists, it is largely a skills gap. Effective public policies must recognize the role of skills in determining wage levels. These findings carry tremendous value for policymakers who will no doubt be called upon to “solve” the perceived problems surrounding part-time employment.